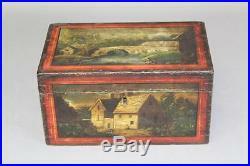 MUSEUM QUALITY HUDSON VALLEY 19TH C FOLK ART PAINTED DOCUMENT BOX ALL ORIGINAL. STRAIGHT FROM AN OLD CONNECTICUT COLLECTION. THE ABSOLUTE BEST EARLY 19TH CENTURY HUDSON RIVER VALLEY PAINT DECORATED DOCUMENT BOX. New York State, in American Poplar. THE ORIGINAL PAINTED DECORATION IS THE BEST WE HAVE EVER SEEN on a document box and it rivals the great painted document box in the Nina Fletcher Little sale from 1994 in New York City, (see photos). THE LEFT SIDE IS ON A WATERFALL AND FOLIAGE SURROUNDING IT AND THE RIGHT SIDE IS OF A SMALLER WATERFALL ENDING IN A STREAM. BOTH ARE SURROUNDED BY A TOMATO RED BORDER WITH ADDED GOLD HIGHLIGHT LINES. THE FRONT IS A WONDERFUL TWO STORY COLONIAL HOUSE WITH AN ATTACHED ELL. THERE IS A DEER NEAR THE HOUSE AND A WOMAN SITTING IN FRONT OF THE HOUSE. THERE IS GREAT LANDSCAPE DETAILS THROUGHOUT. THIS TOO IS SURROUNDED BY A TOMATO RED BORDER WITH GOLD LINE HIGHLIGHTS. THE TOP IS OF THE TYPICAL HUDSON RIVER STONE BRIDGE. THERE IS A MAN IN THE FOREGROUND THAT IS FISHING. THERE IS A BARN AND AN OUT BUILDING OR SHED ALONG WITH THE TYPICAL LANDSCAPE ELEMENTS. IT TOO IS SURROUNDED BY A TOMATO RED BORDER WITH GOLD PINE HIGHLIGHTS. THE BACK CONSISTS OF THE TOMATO RED PAINT THROUGHOUT. ALL TH PAINT IS ORIGINAL AND WELL CRAZED AND CRACKLED. WE COULD NOT FIND ANY IN-PAINTING AND IT BLACK LIGHTS WELL. THIS GREAT FOLK ART PAINTED BOX IS ABOUT THE BEST YOU WILL FIND. THE BOX ITSELF IS FULLY DOVETAILED WITH MINIATURE HAND CUT DOVETAILS THROUGHOUT. IT STILL RETAINS ITS ORIGINAL BRASS HINGES AND BRASS LOCK WITH NO REPAIRS, BREAK OUTS OR LOSSES. THIS GREAT PIECE HAS ONLY THE MOST MINOR LOSSES TO THE PAINTED DECORATION. There is also some minor edge and rim wear as shown in the photos and are added for complete condition disclosure (see photos). FOLK ART PAINTED BOXES LIKE THIS ARE VERY RARE AND SELDOM HIT THE MARKET. For further reference and discussion see, “American Painted Furniture”, by Dean Fales. The size is wonderful, it is 9″ across the front, it is 5 1/2″ deep and it stands 5 high. Typical wear associated with the age of the item. Low starting Price and NO reserve. Please understand that we are out on the road for most of the week trying to find the items we sell. Over sized items such as furniture can take a few extra days. We will gladly come to an amicable resolution if there is a problem with an item. We stand behind each of our descriptions but please remember mistakes can be made. Auctiva Free Image Hosting. Show off your items with Auctiva’s Listing Templates. The item “MUSEUM QUALITY HUDSON VALLEY 19TH C FOLK ART PAINTED DOCUMENT BOX ALL ORIGINAL” is in sale since Wednesday, January 04, 2017. This item is in the category “Antiques\Primitives”. The seller is “three-girls” and is located in Connecticut. This item can be shipped to United States.